Yesterday, I had the honor of seeing a memorial exhibition for the artist, Ahmed Basiony. I was accompanied by one of Ahmed’s close friends and could see the pain in his eyes at every piece, every article of clothing on display, his videos, his white rubber boots. 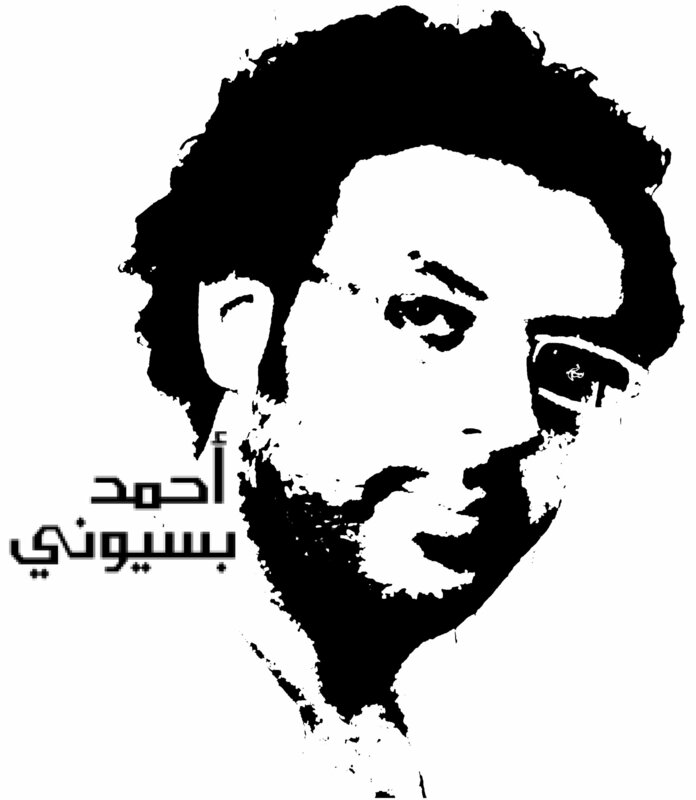 As Shady El Noshokaty describes, Basiony is considered one of the most important artists of the new generation of contemporary Egyptian artists. After acquiring his master’s degree in Creative Potential of Digital Sound Art, he was working on his PhD Thesis on The Visual Aspect of Open Source Programming in relation to the concepts of digital art. His practice varied greatly and evolved rapidly. His early large-scale expressionistic paintings. Then his work took a turn in a more experimental direction involving new media and multimedia installations. On January the 28th, 2011, Ahmed Basiony died of gunshot wounds inflicted by snipers from the Egyptian Police Forces on Tahrir Square during the start of the 25 January 2011 revolution. He left behind a wife and two children (6 and 1 years old). In 2011, Basiony was selected post-mordum to represent Egypt in the Venice Biennale 2011. And now his friends celebrate his life, his companionship, his genius and his legacy with events throughout Egypt this month. Just a short taxi ride away from the exhibition, 21 of the liberal and secular parties came together for the first time. They took to Tahrir Square to reclaim the original demands of the revolution and to protest the acquittal of the perpetrators of the Battle of the Camel and Morsi’s recent firing of the prosecutor-general. Young and old were in the square, literally babies and men with canes. Standing with a unified message. The U.S. Embassy sent a report that stated 8,000 people were out there. But a majority of the crowd packed in to Mohamed Mahmoud Street, just past the Hardees. Every couple minutes, a kid would be rushed back towards where I was standing safe on a curb. Strangers would get the injured guy medical care for some sort of rock wound to the head or face. The man next to me was bleeding from the back of the head, covered with a loose and inadequate bandage. This was not going to be the peaceful mass demonstration the liberals needed. 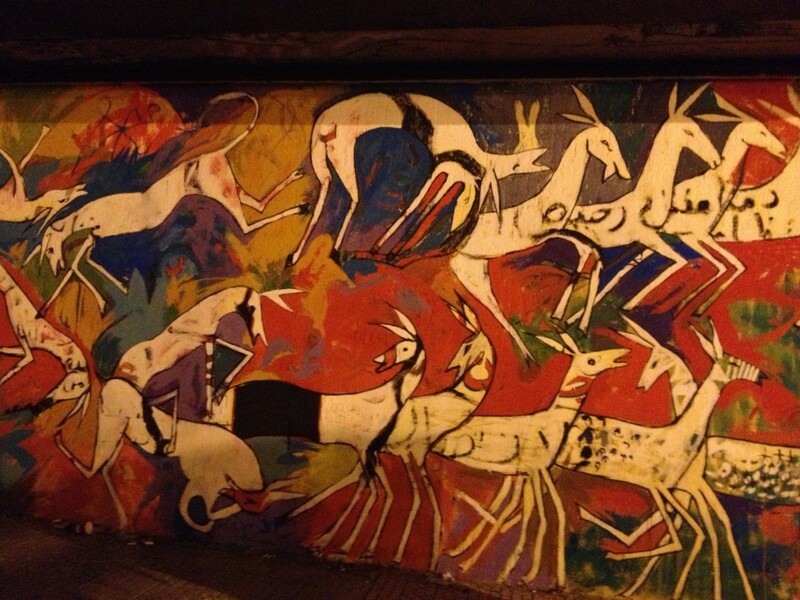 New mural on Mohamed Mahmoud Street. 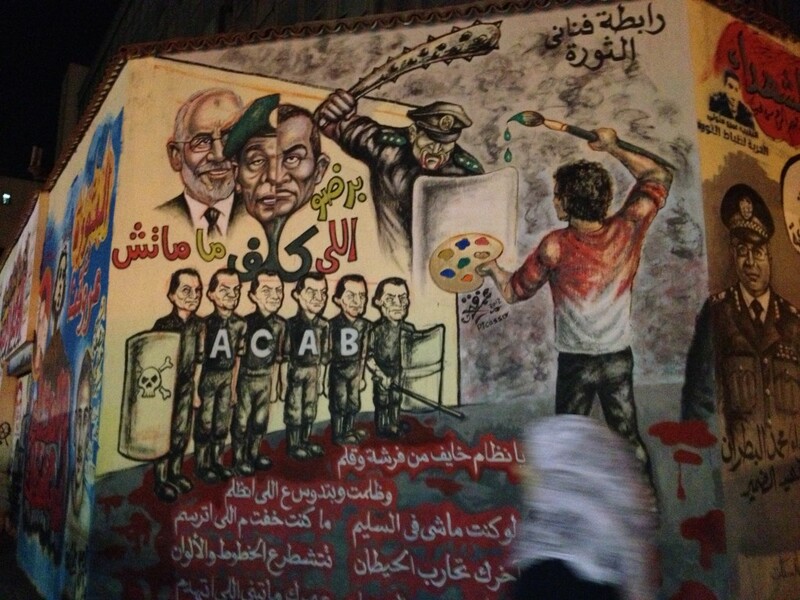 At the far end of this same mural street yesterday, the liberals and secularists, the people who had first put the revolution into motion, were fending off the Muslim Brotherhood (MB). I couldn’t see that far down the street, but heard reports from the taller folks in the crowd. My friend who was with me could pretty much sense what was happening without looking. As more and more men were brought back with wounds, and ambulances started to crawl through the crowd, we decided to leave. I spent the rest of the afternoon monitoring Twitter for news of injuries, movements of the MB from other areas into the heart of the square, tearing down the stage, claims of gun shots and maybe one death. My friends and I turned on local television and saw as the violence escalated in the heart of the square, to an embarrassing level. Egyptian v. Egyptian. Men in suits and casual, liberal clothes versus men in more religious wear. No police or security pretense whatsoever. Molotov cocktails. Buses on fire. Groups running in different directions. The MB claiming their members were not in the square. My friends and I spend the evening in conversations far away from the area. We talked about contemporary art, how to plant the seeds of progress during such a turbulent transition, about deep-seated hope, about Morsi and his party’s dealings, what Nov 4 elections will mean for Egypt, the World Bank, and how friendships are made and sustained here. I kept having this thought that we need to have a day in Tahrir Square where thousands come to dance. To dance their hope, their anger, to grab hands and find counter-balance with one another, and then to boogie. I’ve liked it Shawn . but I think there were people with no trends at the begining of the revolution , not only the liberals and secularists .